LinkedIn wants you to brick it in the data centre by following it and its friends with a new standard for data centre hardware that pushes its ambitions to the edge and into competition with the Facebook-derived Open Compute Project. If that sounds an awfully lot like the aims of Open Compute, you're not alone in thinking so. To The Register's mind, the important difference between Open19 and Open Compute is the intention to define a single set of kit that will run anywhere. That's important because it's increasingly assumed that public clouds will often be too expensive or too slow to handle data gathered by sensors. Putting computing muscle closer to where data is made - “the edge” is therefore attracting plenty of interest. If you need edge computing, it may be that you would prefer that it uses the same kit and designs as the stuff you use in your main bit barns. Open19 looks to have set out its stall on hardware homogeneity no matter where you run. Indeed, it is promising common components for infrastructure. 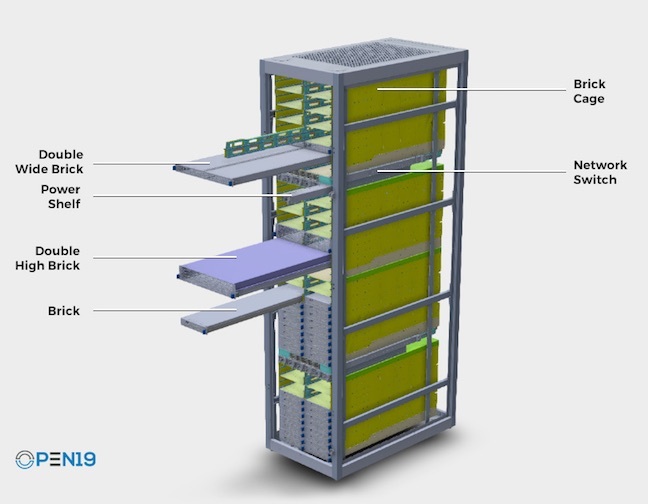 Participants include GE Digital, HPE and edge data centre upstart Vapor IO, and they've developed the idea of a “brick cage” a chassis somewhat akin to a blade chassis, offered in 12U or 8U configurations and designed for quick and easy cabling for the “bricks” that will reside within. Those bricks can be servers or storage and come in different sizes. The idea appears to be that you'll populate each brick cage with kit that meets your needs, then hook it up to a full-width switch or “power shelf”. Importantly, it appears that Open19 isn't mandating particular servers: if a machine fits into one of the four brick specs, it should get along fine. White box server-makers SuperMicro, Inspur, Wiwynn and QCT have signed up, as have the likes of Broadcom, Mellanox and Schneider Electric. So the whole data centre gang is here and ready to play.